Essays that teach and inspire, curated by Atwan and McQuade. Memorable. Provocative. Timely. Luminous. 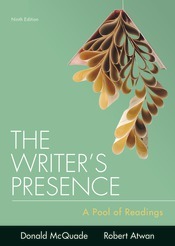 The Writer’s Presence brings together the best of the essay genre in a teachable, flexible compendium, because great reading inspires great academic writing. Edited by Best American Essays series editor Robert Atwan and composition teacher and scholar Donald McQuade, The Writer’s Presence offers a rich pool of readings you’ll enjoy dipping into. The essays here address topics students care about, from race in America to transgender identity, with careful attention to voice, tone, and figurative language. Classic authors like Langston Hughes and George Orwell join rising stars like Roxane Gay and Eula Biss for a grand tour of masterful writing. Divided into three parts—personal writing, expository writing, and argumentative writing—The Writer’s Presence also provides practical strategies for student writers, giving them tools to sharpen their own voices and imagination. An e-book option offers even greater flexibility and convenience.